I've been rereading 'Flaubert’s Parrot' by Julian Barnes, which is a funny, sad, literary novel from the 1980s and in my lightweight view is one of the finest written during my lifetime. Mr Barnes refers to the Normandy travels of the Reverend George Musgrave Musgrave (that's his name, not an accidental duplicate word) and, in particular, a conversation he reports in his 1855 book 'A Ramble Through Normandy'. The Reverend Musgrave amuses himself by questioning 'a thriving merchant of Rouen' who, despite being 'upwards of sixty years old', had never heard of mint sauce! Of course, the Reverend 'advised him to take up a new set of notions on English cookery'. It isn't what the Reverend intended but I was reminded of this dish from Normandy. I've never really understood this because the French are not entirely averse to serving lamb with mint themselves, as in this dish. 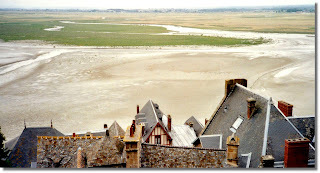 You can find some excellent lamb in Normandy, especially the lamb raised on the salt marshes. Most Normandy salt-marsh lamb, it seems, never leaves Normandy but Welsh salt-marsh lamb is also excellent if you can find it. The local crème fraîche d'Isigny is justifiably famous too if you can get some but another crème fraîche would be fine as a stand-in. This is old-school Normandy cooking and I must admit that the aromas drifting from a classic Normandy kitchen are pretty much guaranteed to transport me to a very happy place. Presumably that was also true for the Reverend Musgrave not to mention Flaubert; although I can't say the same for his parrot since it appears that it was stuffed. I'm a bit of a fan of lamb neck fillet – it's an adaptable cut that's generally not too expensive. It's excellent for slower cooking, but good quality neck fillet responds well to more rapid cooking too. You do need to take a bit of care to ensure that the sinews are trimmed off, though. I used 2 small fillets weighing just over 200 g each, which should comfortably serve 2 people. If the fillets are larger, you may need to adjust the cooking times a little. Melt a little butter in an ovenproof frying pan. Soften the shallot in the butter over a gentle heat without allowing it to colour. If you're really gentle, then this will probably take around 15 minutes. Add the cider to the pan, bring to the boil and continue boiling until the cider is reduced by about half. Lower the heat and add the sprigs of mint to the pan (keep the few extra leaves aside for later). Simmer for another minute, then pour the contents of the pan into a jug and set aside. Preheat the oven to 170°C. Give the pan a quick wipe, put it back on the heat and melt a little more butter. Season the lamb, place in the pan and fry until it's lightly brown on all sides. Transfer the pan to the oven and roast for 5 or 6 minutes. This will be fine for small fillets, but if they're larger or you just like well-done lamb, then leave them in the oven for 2 or 3 minutes longer. Put the lamb fillets aside somewhere warm to rest while you finish the sauce. Pour off any excess fat from the pan (remember the pan will be hot from the oven – I've been known to forget). Put the pan back on the heat and deglaze with the calvados. Remove the mint sprigs from the cider mixture and pour it back into the pan. Bring up to simmering point and stir in the crème fraîche. Adjust the seasoning, stir in a small knob of butter and keep the sauce warm while you slice the lamb and chop the remaining mint leaves. Pass the sauce through a fine sieve and stir in the chopped mint. Arrange the lamb slices on warmed plates and pour over the sauce. Serve immediately. I think some simple new potatoes and green beans sit nicely alongside this dish but something like a potato rösti would work pretty well too. I'm submitting this to the latest Novel Food event hosted by Simona Carini at briciole with apologies that the connection between the novel and this dish is just about as obtuse as is usual for me. I'd recommend ‘Flaubert’s Parrot’ to anyone who wants to read an excellent, literary novel but if you're ever inclined to read ‘A Ramble Through Normandy’ then I feel I should warn you that the Reverend Musgrave could never be accused of breviloquence and it might be quicker to go for a ramble through Normandy for yourself. While I'm on the subject of Julian Barnes I would also strongly recommend his collection of essays ‘The Pedant In The Kitchen’, especially if you've ever tried to write down a recipe for others to read. I have it on good authority that this is an ancient type of gâteau from Nancy in north-eastern France although I have to confess that I couldn't find a recipe that's older than the 1960s (due to poor research, no doubt). It's one of those classic flourless cakes which, in this case, is enriched with chocolate. There are some recipes that do add a little flour, which will help to stabilise the cake but I'm hoping that this flourless version is as light and pure in flavour as the real thing should be. It's a recipe that's easy to remember. Essentially it's equal amounts of each ingredient (if you consider the ground almonds and potato flour as a single entity) plus eggs. This is not the only type of cake that you might find described as a Gâteau de Nancy. The citizens of Nancy seem to have a number of treats at their disposal from large meringue confections to macarons and cakes flavoured with the local plum liqueur. They are obviously wise and happy people. A small slice is lovely with coffee but the cake really comes into its own as a dessert served with a little crème anglaise or crème fraîche and maybe a few choice raspberries. Preheat the oven to 170ºC. Line the base and butter a 20 cm round cake tin - a springform tin is ideal if you have one. Melt the chocolate either in a microwave or in a bowl over simmering water. Put the melted chocolate in the bowl of a mixer (make sure it's not too hot) and add the butter. Beat together thoroughly. While that's happening, separate the eggs. Beat the egg yolks into the butter and chocolate mixture one at a time. Add the sugar and beat in thoroughly. Add the ground almonds and mix in. In a separate bowl, whisk the egg whites until they form stiff peaks. Stir a couple of tablespoons of the whisked egg whites into the chocolate mixture to loosen it a little and then carefully fold in the rest of the egg whites together with the potato flour. Put the mixture into the prepared tin and gently level the top. Bake for around 25 minutes. Check that the cake is ready with a knife point in the centre. The middle of the cake should still be moist and you may see a few sticky crumbs on the knife but it shouldn't be liquid. Remove the cake from the tin as soon as possible: leaving the cake in the tin seems to increase the chance of the top cracking and sinking too much. The cake will be fragile so be careful. Allow to cool on a rack. Many bakers seem to sprinkle this cake with icing sugar but I've noticed that bakers from Nancy don't sprinkle and so I haven't either in a belated and haphazard attempt at authenticity. I feel like a bit of an outsider in the world of blog link-ups these days and so I don't usually take part. But this month Tin and Thyme is hosting the last ever We Should Cocoa link-up and so, for old times' sake, I'm submitting this cake. 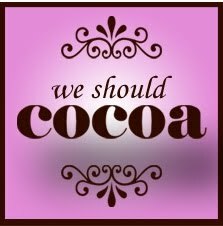 Over the years We Should Cocoa has been the home of many very fine, very chocolatey recipes and I'm wishing it a fond farewell. You may well imagine that I'm a sophisticated and elegant man-about-town but allow me to disabuse you a little. I can be a thoroughgoing tatterdemalion if I put my mind to it. I was going through a slovenly phase (it was my butler's night off) when I put the following together. I'm probably in a lot of trouble with the people of the Basque region for mucking about with these local specialities but I swear that I do it with a great fondness and respect and only partly because I've had a glass or two of kalimoxto. Let's start with my errant sort of muxu…. I fancied something to go with my evening espresso and so I made this inelegant, chocolatey sort of muxu. A few years ago it became the thing (at least among food bloggers) to create sophisticated, professional looking macarons. Quality patisserie is a wonderful thing but it's not what I usually enjoy baking and I'm rather glad that we've moved on a bit. The real muxu is a refined Basque speciality and mine are not the real thing: they're an idiosyncratic, delinquent tribute to the original. They're also simple to make and perfect with coffee. They do bear a distant resemblance to the sophisticated macaron although they'll almost certainly deny it. Thoroughly mix together the sugar, almonds, vanilla and cocoa powder. Whisk the egg whites to the soft peak stage. Gently stir the egg whites into the dry ingredients. This will give you quite a firm mixture - don't worry, that's fine. Any serious baker would probably reach for a piping bag but I just spoon the mixture into circles of around 5 cm diameter on lined baking sheets. You should get around 24 - 28 circles of mixture, but don't worry if you get more or less - you can just shorten or lengthen the cooking time a little to make up for it. You now need to set the trays aside to let the crust of the muxus dry for at least 1 or 2 hours or even overnight. If you want to speed the process up, put the trays in a fan oven that's switched on without any heat. Preheat the oven to 200⁰C. Just before putting into the oven, use a very sharp knife to cut a shallow slash across each dollop. Bake for 8 - 10 minutes. When cooked, the muxus should be crunchy on the outside and chewy in the middle. Traditionally two pieces should be sandwiched together, base to base, while still fairly hot from the oven - they will stick together quite easily. (It's how they get their name - muxu means ‘kiss’ in Basque I'm told). But keep them separate if that's what you fancy. You could also add just a little orange marmalade mixed with a touch of Cointreau to the base of the muxus before joining together. They'll store well enough in an airtight container, but they'll be more chewy than crisp after a day or so. No less tasty, though. If you want the real muxu experience then go to la maison Pariès and, if you happen to find yourself in St Jean de Luz (or Biarritz or Paris for that matter), then why on earth wouldn't you go there? By the way (pardon my nerdiness), muxus are often called mouchous, which is a much more French looking name. And now that we've worked up a thirst, how about a kalimoxto? The kalimoxto is the easiest and the least stylish “cocktail” I know. In fact, you might think that I've finally taken leave of my senses. But don't knock kalimoxto till you've tried it. Obviously once you've tried it there's a pretty good chance that you'll knock it with considerable vigour. See if I care; I still like it. I don't think I should tell you precisely which sort of wine to use, but please don't choose an expensive one. Something fruity, pleasant and reasonably cheap should do the job. Just remember to stick it in the fridge before you're thirsty. I should also be using a cheap cola I suppose but I'm a fan of some of the newer and expensive colas, especially Fever Tree Madagascan Cola and Fentimans Curiosity Cola, and so that's what I use. Put plenty of ice cubes into a tall glass (preferably a very cheap one). Half fill the glass with chilled red wine and top up with chilled cola. Add a generous squeeze of lime. Drink. Pigeon is a very underused meat (at least it is in the UK) but it's far too nice to ignore. I remember that it became quite a trendy thing to eat in the 1980s, often in warm salads or served with soy sauce and sesame. Then it seemed to fade away again. Admittedly pigeon does have disadvantages - there's not a huge amount of meat on a pigeon and what there is can be tough. But it really doesn't have to be like that. This sauce is based loosely on a Ming Tsai recipe from the 1990s (if memory serves) and the whole dish is simple to put together. Do make sure that you allow enough time for the marinade to do its work, though. I served the pigeon with simply steamed potatoes and roasted beetroot this time, but rice or mash (sweet potato mash, maybe) would be fine and dandy too. You could also ease off on the amount of sauce and make the pigeon the star of a warm salad with interesting leaves, new potatoes and whatever else you fancy. (That's a very 1980s option but it's one that's worth reviving). I find that it's easier to get hold of pigeon breasts than whole pigeons these days, but if you're faced with whole pigeons, then remove the breasts and make a stock with the rest of the birds. I know that might sound like a bit of a faff but pigeon stock is lovely stuff and really useful for casseroles and sauces. Sorry about the quality of the picture - it's what happens when you use a camera that's punching above its weight in the dark. Mix together all the marinade ingredients, pour over the pigeon breasts and place in the fridge for around 2 hours. Drain the breasts, reserving the marinade, and fry in a little oil over a medium heat for about 4 minutes, turning once. The pigeon should be cooked but still quite rare. It's really easy to overcook the pigeon and end up with tough meat, so keep an eye on the time. Remove the breasts from the pan and set aside but keep them warm. Pour the marinade into the pan, turn up the heat and reduce the amount of liquid a little (or as much as you fancy). 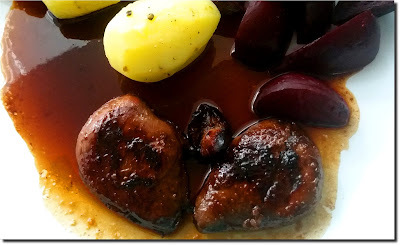 Immediately before serving return the pigeon breasts briefly to the pan and coat in the sauce. Many people have bucket lists consisting of adventurous or highly dangerous activities like skydiving or eating at a restaurant on its opening day. But I have a bucket list of cakes. I'm much happier that way. Here's one I've just ticked off on that list. Many of the recipes that I publish on this blog are not particularly well known or are hard to find elsewhere. (My theory being that at least I'll know where to find them when I want them next time). This cake is an exception. It's really well known (at least, it is in the UK). You might have seen it on TV, on a recipe site, in blogs, in a book, in a magazine or you may have been lucky enough to try it yourself. I've made a lot of lemon cakes over the years but, despite my best intentions, I hadn't made this one until now. Many years ago Raymond Blanc began making and serving this cake to guests at Le Manoir aux Quat'Saisons in Oxfordshire and it's still made and served there today. It's actually a pretty easy cake to put together. The only tricky bit is getting the glaze just right. That's a bit of a faff, but it does give the cake a lovely finish and I'm convinced it's worth the effort. You can find the recipe here or here (and probably quite a few other places too). I've heard this cake described as the ultimate lemon cake by some but also as a madeira style of cake with extra lemon and not really that special by others. So, is it the best lemon cake you can make? Well, sat here paying bills on a cloudy afternoon in Surrey it's unquestionably an extremely pleasant cake to lift the gloom and, yes, it's a little like a light madeira cake in texture. On the other hand, if you happen to be whiling away a sunny afternoon on the lawns outside the Manoir after playing an incompetent and farcical game of croquet, would this be the best lemon cake you could imagine? Oh yes, very probably. Fallue isn't an obscure Shakespearean character, it's actually one of the types of brioche that you might come across in Normandy. It's less sweet than some and uses crème fraîche instead of some of the usual butter. I promised to get around to posting this recipe when I said it was the chosen partner for teurgoule, although you really don't have to make a teurgoule to enjoy this bread. I know that all good food bloggers should spend many happy hours mixing and kneading their bread by hand and that would be nice but I honestly don't have the time. I use a bread machine to prepare this dough and I don't care who knows it. Of course, you can make the dough in a much more traditional way if you wish. Unlike some brioche recipes, this is very simple to put together and even simpler if you use a machine. I'm not claiming that this is an authentic fallue but it is based on some genuine Normandy recipes that I've had ferreted away for some time and that I've adapted a little for machine preparation. Fallue is usually embellished by snipping around the top of the risen loaf with scissors just before baking. This creates a sort of crown on top of the loaf. I must admit that I only make a token effort at doing this because I usually slice brioche or fallue as soon as they're cool which means that nobody's going to notice. This will make 1 large (and I do mean large) loaf but it's a size that suits my bread machine and keeps my freezer stocked up. I use a Panasonic bread machine and add the ingredients in the order given below. Other bread machines recommend that liquids should be added first, so check the instructions for yours. At the risk of being even duller than usual, I think a couple of notes on the ingredients might be useful. The flour - I used a French T65 bread flour for this recipe although I know that some bakers prefer T55 for this kind of loaf. You can buy T65 flour in the UK but any strong bread flour will do the job, although you might need to add a little milk if the flour you use is very absorbent. If you do use a French flour then you may find the bread won't keep fresh for as long, so freeze any slices that you can't eat reasonably quickly. The crème fraîche - This needs to be thick but pourable and a full fat version would be best. Where I live in the south of England there's quite a wide choice of types of crème fraîche but I know that's not the case everywhere. Very fresh crème fraîche is often used for baking in Normandy and that really isn't particularly sour so it's probably best to avoid using sour cream as a substitute. It would be better to use a pourable, double (or heavy) cream in this recipe if you can't find suitable crème fraîche. 16 g fresh yeast, crumbled (or substitute 7 or 8 g of dried, fast-acting yeast). Add all the ingredients (except the extra egg used for the glaze) to your bread machine in the order given unless your instructions tell you to add liquids first, in which case reverse the order (see above). Set the machine to work on a standard dough program, which will probably take somewhere around 2 or 2½ hours. Once the program has finished, turn the dough out onto a floured surface and knock back to deflate it. (The dough will be quite sticky, but don't worry, that's normal). Gently form the dough into a sausage-shaped loaf of around 30 - 33 cm in length and place onto a lined baking sheet. Put the dough somewhere warm and let it rise again for between one and two hours until it's roughly doubled in size. Preheat the oven to 180⁰C. If you want to create the “crown” then snip around the top of the fallue with kitchen scissors to make a ring of spikes. (This is much the same process as creating the spikes on hedgehog bread, if you've ever tried that). Make an egg wash by mixing the remaining egg with a little water and use it to brush the top of the fallue. Bake for around 25 minutes until the fallue is golden on top and sounds nicely hollow when tapped. (Be gentle when testing because the crust is not very robust while hot). Transfer to a wire rack to cool. Slice and serve with teurgoule if you're feeling authentic or just enjoy some slices as part of a lazy breakfast with butter (from Normandy, if possible) and plenty of jam. In Normandy every Sunday morning in accordance with ancient tradition the fearless men of the Calvados region gather with their forks and hope to hunt the wild and menacing teurgoule. OK, I'm lying. Teurgoule is indeed a speciality of the Calvados area but, let's not beat around the Normandy bush, it's a type of rice pudding. There are a number of stories about the origin of this simple speciality but I'm not sufficiently knowledgeable or gullible to say if they're true or not. So let's just say that this is a very slowly cooked rice pudding that's usually flavoured with cinnamon. 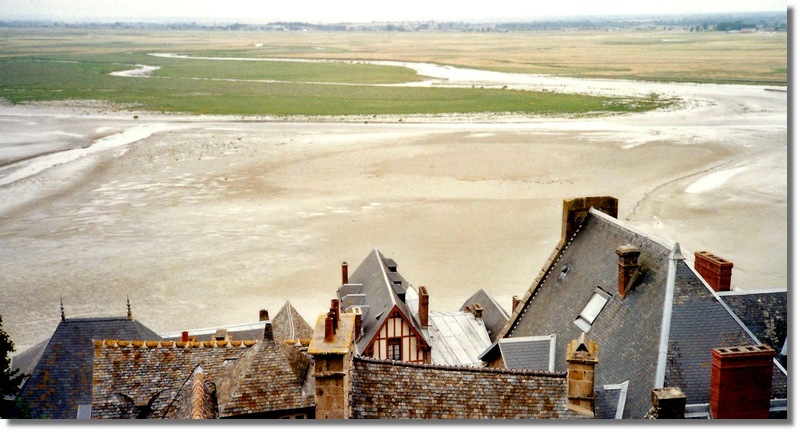 That may seem a bit of an incongruous flavour for northern France but once upon a time spices, including cinnamon, would come ashore at Honfleur and the other ports along the Normandy coast. As for the strange name, there are plenty of explanations and it's often translated as “twisted mouth” but, since it has more of a patois or slang origin, I think that “mangled mug” might be better. The implication seems to be that you'll be gobsmacked at how nice it tastes once you try it. Traditionally this dish should be made in an earthenware bowl but a good, old-fashioned British pudding basin will work just fine. It needs to have a capacity of a little over 1 litre but, ideally, not much more than 1 litre. As with so many traditional and regional French dishes, I’m pleased to say that the teurgoule has a confrerie to preserve and promote it and this is pretty close to the approved and official recipe. To be honest, I'm not that fond of cinnamon and I replace it with vanilla powder (my apologies to the members of the confrerie). I'd expect this to serve 4 people but I know that there are some blighters who can't stop eating this pudding once they start so it's best to have plenty. Preheat the oven to 150⁰C. Mix the rice, sugar, salt and cinnamon or vanilla together and place in the bottom of your chosen dish or basin. Pour the milk gently over the rice mixture, being careful to avoid disturbing it too much. Bake in the oven for 50 minutes. Turn the oven temperature down to 110⁰C and continue cooking for 4 - 4½ hours. (Yes, it really does take that long). When the teurgoule is ready the top will have become dark brown and look slightly alien but the mixture underneath will still have a bit of a wobble if you tip the bowl. The teurgoule will thicken a little as it cools. Allow the teurgoule to cool and, if you're not eating it immediately, store in the fridge. Either way, I thinks it's best served at or close to room temperature but serve it hot or very cold if that's what you fancy - it will taste good at all temperatures. There always seems to be disagreement in Britain between lovers and haters of rice pudding skin. Teurgoule is cooked for so long that the skin resembles leather in my opinion. I may well serve up the skin but that's largely to prove that it's been cooked authentically. I expect everyone to push it aside and refuse to eat it. The confrerie will tell you that teurgoule should be eaten alongside fallue and I'm certainly not going to argue with that. Fallue is hard to find outside of Calvados and a decent brioche will do in its place (I'm in so much trouble with the confrerie for saying that). If I don't get too distracted, I may get around to a post about fallue shortly. To end my very short series of "the Italian recipes that I really had to write down sooner or later" I'm offering something to finish the meal. This chestnut cake is based on a truly venerable recipe dating back as far as the 16th century but many variations have been turning up recently in glossy cookbooks. Unfortunately, the authors frequently disagree on just how the castagnaccio should look and taste. So when I got hold of some chestnut flour (it was French not Italian, but that's life) I just had to try playing around with it for myself and I've decided that this relatively dense version works best for me. This is a remarkably easy dish to put together. In fact, the most difficult thing seems to be choosing which flavourings and additions you might fancy. I'd suggest that raisins are essential. I soaked mine in sloe gin, which isn't remotely Italian but works really well. Another alcohol, Earl Grey tea or even water will do the job if you prefer. Pine nuts are important too, but you could add other chopped nuts such as walnuts or hazelnuts as well. Orange zest is good but in this case I used an olive oil flavoured with orange instead. A little rosemary is often sprinkled over the top of the cake, but I know that Gennaro Contaldo adds some dark chocolate to his castagnaccio and a little of that grated on top is an interesting alternative. (Actually, I used chocolate on some parts of the cake in the picture and rosemary on others). Finally, you may want to vary the amount of sugar given here, partly because you may prefer a sweeter cake (or even a less sweet, earthier taste) but also because chestnut flours seem to vary quite a lot in sweetness. Before I get on to the recipe, though, I must in all honesty admit that in my opinion you really have to be a fan of chestnuts to eat a lot of it. It has a very distinctive flavour. After eating a number of castagnaccio variations in a short period, I don't think I could look at another chestnut for some time. But if you are a chestnut fan, this will definitely satisfy all your chestnut cravings. Most people make this in a round cake tin (or a pizza pan) but I used a 32 x 18 cm brownie tray, which makes it easy to divide up into small dessert portions. I find this is quite filling and so it should serve 12 or 14 people. Soak the raisins in sloe gin or your chosen liquid for at least an hour. Preheat the oven to 180°C. Prepare the baking tray by greasing it thoroughly with butter or olive oil. Mix together the chestnut flour and sugar in a large bowl. Combine the water and olive oil in a jug. Gradually pour the water and oil onto the flour and sugar mixture while stirring. As the mixture begins to thin, switch to a whisk and whisk enthusiastically while continuing to add the liquid. You need to make sure there are no lumps. The mixture might seem to be too liquid for sensible cake making, but think of it as a batter rather than a standard cake mix. Stir in the orange zest, if you're using it. Pour into the baking tray. Don't worry if the tray seems a little shallow since this won't rise like a more conventional cake. Drain the raisins. Scatter the pine nuts and raisins over the mixture in a reasonably even but random way. Finally, sprinkle the rosemary or chocolate over the top. Bake the castagnaccio for 45 minutes but cover it with foil after 15 or 20 minutes if it's browning quickly. It's difficult to know when the castagnaccio is cooked to perfection – the conventional cake test with a knife point or tester can be misleading. It needs to feel springy rather than sloppy to the touch and should look cracked on the top. The finished cake can be served slightly warm or at room temperature with a little ricotta or fromage frais but it also works well with a harder cheese – ideally one with a sharp rather than an earthy flavour. It may not be traditional but I think it's also very good alongside a little ice cream. A small glass of dessert wine wouldn't be out of place either. Castagnaccio will keep well for a few days in an airtight container. I stopped making vegetable purées for many years because back in the 1980s it was common practice to purée anything you could lay your hands on, especially if it was brightly coloured. It just got a bit too much like baby food. But I shouldn't have been so hasty. Vegetable purées are easy to make, they can be prepared in advance and reheated when required and, if you choose the right type of vegetable, the colour definitely can't be ignored on the plate. That's probably why purées not unlike these two seem to turn up quite regularly in slightly too expensive restaurants. This purée is a variation on the usual braised red cabbage and will sit very happily alongside ham, game, lamb or just about anything else you might fancy. The more crème fraîche that you add at the end of the recipe then the pinker the result will be. Many years ago I met a man in Brittany who told me that he'd cooked his wife a Valentine's day meal in which all three courses consisted entirely of pink food. To this day I'm still not sure what I think of that. I've admitted to a bit of an obsession with pomegranate molasses in the past but my source of all things that are good in Turkish cooking Ozlem of Ozlem’s Turkish Table pointed out some years ago that it complements red cabbage really well. She's absolutely right, of course, and I've added it ever since. If you're feeling really cheffy then you can prepare a green cabbage purée as well to contrast with the red and deeply impress your guests. In a large frying pan, gently soften the onion in a little butter or oil. While that's happening, remove and discard the core of the red cabbage and chop or slice the remainder quite finely. Once the onion has started to soften, add the red cabbage to the pan and fry gently for 2 or 3 minutes, stirring to ensure that the cabbage doesn’t stick together. Add the apple and season with salt and pepper. Pour over the stock and pomegranate molasses, cover the pan leaving a bit of a gap for some of the steam to escape and bring to a gentle simmer. Simmer until the cabbage is tender (or, at least, reasonably tender) - this could take anything from 30 to 60 minutes. Stir now and then and add a little extra water if it threatens to dry out. At the end of this time the cabbage should still be nicely moist but most of the liquid should have disappeared. If you still have some liquid left, then drain the cabbage before the next stage. 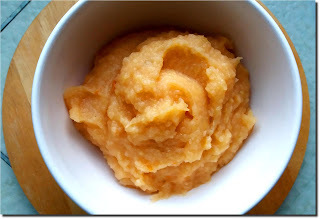 Purée the cabbage mixture in a food processor or blender until smooth (or as smooth as you'd like it to be). Season with more salt and pepper if it needs it and add a little honey if it's not sweet enough. You could also add more pomegranate molasses at this stage if you feel like it. To serve, stir in as much crème fraîche as you fancy and reheat gently. Parsnip purées often use cream to produce quite a rich result but this is a bit lighter in style. There's not much point in trying to compete with the powerful flavour of parsnips but I’ve used some Aperol liqueur and a few other bits and pieces to add a bit of contrast and complexity to the end result. The idea for this recipe came from watching a chef braise some parsnips in Pineau de Charentes and that's not a bad alternative if Aperol isn't to your taste. Alternatively, you could use some Campari for a more astringent flavour if that's what appeals to you. I think this purée works well alongside pork or beef but it's possibly even better with game. Top, tail, peel and quarter the parsnips. If the parsnips aren't young and tender, then cut out any woody centres. Peel and core the apple and cut into 6 or 8 pieces. Add the parsnips and apple to a pan that's wide enough to accommodate them in one layer. Add the orange zest and pour over the stock and Aperol. Tuck in the thyme sprigs. Put the pan on a medium heat and bring to simmering point. Lower the heat and simmer until the parsnips are very tender and the liquid has reduced to a syrup that's coating the parsnips and apple. (If the dish threatens to dry out before the parsnips are ready, than add a little more stock or water). Take the pan off the heat, discard the thyme and reduce the contents to a purée in a food processor or blender. Season with salt and pepper and reheat to serve. Just before serving, stir in the lemon juice (the amount of lemon juice you add will vary according to taste and the sweetness of the parsnips). Years ago I posted a recipe for Navettes from Marseille on this blog and, although they're an interesting and unusual local delicacy, I have to admit that they're a bit of an acquired taste for many people. I thought about that original recipe recently and I felt that it was only right that I should finally get around to admitting that the Marseille navette is not the only navette in the south of France. Here's an alternative that might be a little less alarming. This recipe is based on a navette from the region around the town of Albi in the Tarn. There's no raising agent in the recipe so don't expect a delicate sponge cake but it's lighter and less challenging than the drier Marseille version. Think of it as a little treat to sit alongside or even dip into a coffee or tea. Better still, imagine it with a local Gaillac Doux wine as you sit bathed in the light of the setting sun outside a café in Cordes-sur-Ciel. (Sorry, I got a bit carried away there). Sweet Gaillac can be hard to find unless you're in the area but other sweet wines will do the job. I'm a bit of a fan of Pacherenc du Vic-Bilh from a little to the west of Gaillac and that might be a bit easier to find. Strictly speaking this cake should really be made in a diamond-shaped tin with sloping sides. This is said to echo the shape of the shuttle (navette) used in traditional weaving, which is a symbol associated locally with the Cathars. I'm not going to pretend that I know that this recipe dates back to the Albigensian Crusade but you never know. Since I don't have the real thing, I used a simple 20 cm square tin but, whatever tin you use, make sure that you butter it thoroughly. Recipes for the Navette Albigeoise vary a lot and don't expect this to be an entirely authentic version. If you come across the real thing, you'll possibly find whole almonds on the top of the cake (I prefer smaller pieces), dried or confit orange inside it and maybe less butter in the mix. You might also find a flavouring of orange flower water or rum but I've used some Cointreau instead. Preheat the oven to 180⁰C. Butter the baking tin generously and sprinkle with 1 tbsp caster sugar. I used a 20 cm square tin but use a genuine navette tin if you can find one. Whisk together the eggs and the sugar for a couple of minutes until the mixture has increased in volume and looks very pale. Stir in the softened butter, the flour, lemon and orange zests and your chosen alcohol or juice. Mix together thoroughly, but don't overwork the dough. Add to the prepared tin and even out the top - the dough should be roughly between 3 and 4 cm deep. Place the almonds on the top of the dough. I break them up and add them randomly but arrange whole almonds in a regular pattern if you prefer. Optionally sprinkle the additional ½ tbsp caster sugar over the top of the dough. Adding the sugar gives the cake an all-round light sweet crust but makes the top a little more flaky and liable to leave residue in your drink if you're intending to dip. Bake for 20 - 25 minutes until the top is golden and a knife point comes out clean. Allow the cake to cool in the tin for at least 10 minutes before removing and cooling completely on a rack. Cut into small squares or diamonds (I cut mine into 12 pieces) and serve with your chosen beverage.